Resurrect Dead: The Mystery of the Toynbee Tiles, by Philadelphia filmmaker Jon Foy, is about the kind of people who see signs, who look beyond the everyday surface of things to uncover what lies beneath. People drawn into the mysteries of the world. While Philadelphia appears to be the nexus of the tile activity, nearly identical tiles have been found across the Eastern U.S. in New York, Boston, St. Louis, Kansas City, and Washington D.C., as well as in several South American locations including Santiago and Buenos Aires. Foy’s documentary follows its protagonist, Philadelphia house painter and aspiring artist and musician Justin Duerr, on his quest to uncover the meaning of the tiles and find whoever surreptitiously placed them in the middle of public roadways. Duerr, we are told, was a promising art student in his early years, but was something of a misfit who would often skip school. He is someone “out of step with the world.” His brother tells us he was bullied in high school. Duerr dropped out of school at age 16 and moved into a squat with other youngsters in Philadelphia. Duerr’s crusade to unlock the mystery of the tiles gives his life focus and appears to become more than merely a search for the identity of the tiler — it’s a quest to discern the pattern behind the seeming chaos of the world. Duerr’s investigation follows a tortuous path as he and fellow tile-seekers Steve Weinik and Colin Smith labor to decipher the clues they uncover: details in the text of the tiles, an old Philadelphia Inquirer article about a strange phone call received by columnist Clark DeLeon, a play by David Mamet which may or may not be based on a real-life call to a late-night radio talk program, pirate shortwave radio broadcasts that invade local TV news programs, and interviews with a menagerie of colorful Philadelphia characters who are possibly connected to the tiles. Clues that seem too meaningful to be coincidences turn out to be dead ends. Others lead deeper down the rabbit hole of the mystery of the tiles. Duerr and his compatriots persist as the trail becomes increasingly bizarre. The film is, in a sense, a profile of an individual dedicated, perhaps a bit obsessed, with another obsessive personality. Mr. Duerr wants to solve the mystery of the tiles — to know who made them and why — but he also desires to establish a meaningful connection with the elusive tiler. The movie is also a tale of mass communication in the pre-Internet era. When spurned by the traditional media, the unknown communicator uses fliers, shortwave radio transmissions, and the roadway tiles to broadcast his message. While the more ephemeral of these media have faded away — and would likely have been lost to history were it not for the detective work of Duerr and company — the tiles endured. Although many have deteriorated or been paved over from subsequent road resurfacing, many tiles from the early 1980s persisted for decades after their creation. Making the movie was itself something of an obsession for Foy. He had long known about the tiles, but his plans for the film were hatched when he crossed paths with Duerr through a quirk of fate involving a crank phone call Foy intended for his roommate that was unintentionally picked up by Duerr. Foy subsequently dropped out of UT Austin and embarked on the project to document Duerr’s quest to uncover the mystery of the tiles. While working on the film over a period of five years, Foy funded his effort by cleaning houses and participating in medical research studies. By the end of the film, Duerr and company believe, based on a large amount of circumstantial evidence, that they have identified the individual behind the tiles. And Mr. Duerr arrives at a new understanding of his own quest to encounter the mysterious tiler. Resurrect Dead: The Mystery of the Toynbee Tiles works on many levels — as an investigation of a historical puzzle as well as an inquiry into what motivates individuals to find the meaning hidden deep within the mysteries that lie, quite literally, right beneath our feet. 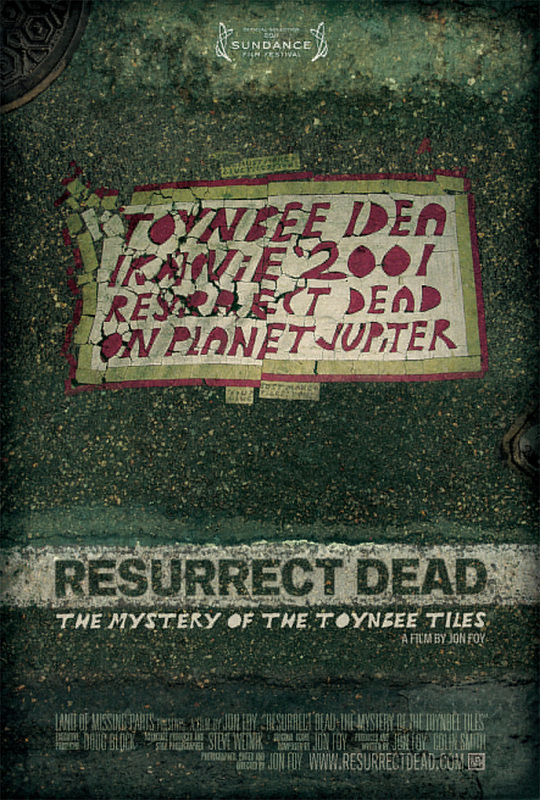 Resurrect Dead: The Mystery of the Toynbee Tiles was directed, edited, photographed, and scored by Jon Foy; and written by Jon Foy and Colin Smith. The film is currently seeking distribution. [Update 1:] Resurrect Dead: The Mystery of the Toynbee Tiles is distributed by Argot Pictures and begins a theatrical run on September 2. Building a Mystery: The Toynbee Tiles and Jon Foy’s Filmmaking Quest. [Update 3:] For additional information on subsequent screenings, photos, and reviews, see ‘Resurrect Dead’: Photos, Reviews, and Ongoing Mysteries. [Update 4:] For recent news about the tiles, see: Toynbee Tiles: Recent Developments and Mysteries Anew. Hear me out, I’ve inspected the tiles and the “handwritting” of sorts and it’s message and I swear I know who the guy is. There is this “crazy” guy who hangs out on the corner of 18th and Market St. in Philadelphia with signs so similar in message and style. Considering there are 60 of these in Philadelphia, I would bet everything it is this guy. He’s an older gentlemen and he’s very easy to spot considering how much signage he wears on himself. Trust me, mystery solved. I read somewhere they were created by a guy with assumed identity of Morasco… Who died in 2003.